If you’ve visited Cummins Falls or Burgess Falls near Cookeville, you’ve experienced their beauty and immensity firsthand. However, you’ve probably also experienced the crowds that can form at these two easily-accessible waterfalls. 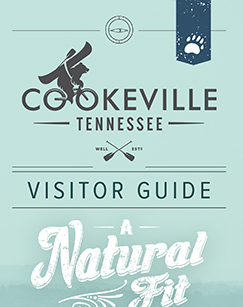 Many visitors don’t realize that there are about 150 other waterfalls in the Cookeville area, most of which see significantly less traffic than the most well-known falls. We’ve rounded up just a few of the best lesser-known nearby waterfalls for you to visit on your next trip to Cookeville. And who knows? You might even get one all to yourself. Fall Creek Falls tends to get all the attention at its namesake state park, but Fall Creek Falls State Park, located less than an hour from Cookeville, is home to another impressive waterfall. At 85 feet, Cane Creek Falls isn’t quite as high as Fall Creek Falls but has a much higher volume of water flowing over its ledge. While this waterfall can be seen from the visitor center, the best viewpoint is a half-mile down the Paw Paw Trail, which also offers a glimpse of the adjacent Rockhouse Falls. The trail also features a swinging bridge over Cane Creek Cascades, making this hike a three-for-one waterfall extravaganza. Waterloo Falls, located on a country road about 15 minutes outside of Cookeville, is truly a hidden gem, and it takes some effort to find it. About 40 feet high, the waterfall is not especially tall, but it’s quite wide and features a clear ledge followed by many rushing cascades. The trail to the falls is short but unmaintained, so be prepared to trek through overgrown foliage. The challenge will be well worth it when you catch a glimpse of the lesser-visited Waterloo Falls. Upper Pine Falls in the Piney Falls State Natural Area forms where Little Piney Creek plunges 80 feet into a deep gorge known as “The Grand Canyon of the Cumberland Plateau.” The 3.5-mile round-trip hike is partially on an old, unpaved road, which winds through an old growth forest of tulip poplars, hemlock trees, and white pines that can tower nearly 100 feet over the landscape. The trail leads you first to the rim of the falls, where you’ll catch a breathtaking view of the creek gorge, and then down to the base of Upper Piney Falls. This impressive waterfall is tucked into the unincorporated town of Grandview, about an hour outside of Cookeville. If you’re short on time, make a pit stop at City Lake Falls in the City Lake Natural Area just inside the city limits of Cookeville. To reach this pretty little waterfall, you only have to walk a half-mile down a flat, paved trail. The trailhead sits right off of I-40, making this a fantastic spot to stop and stretch your legs among some beautiful Cumberland scenery. If you’re looking for a longer day hike or an overnight backpacking trip, a visit to the Polly Branch Falls Trail is in order. The 10-mile trail in the Bridgestone/Firestone Centennial Wilderness forms a loop through the Caney Fork River Gorge, featuring Upper and Lower Polly Branch Falls, as well as an optional out-and-back hike to Copper Canyon Cascades. You’ll also encounter several scenic overlooks along the way where you can admire the unique landscape of the gorge. (Tip: The scenery is the most impressive in the fall or in colder months when the trees are bare.) There is a primitive creekside camping area at the base of the gulf, perfect for pitching a tent in this remote wilderness area. Though by no means a secret, Virgin Falls in the Virgin Falls State Natural Area drops 110 feet, making it one of the most spectacular waterfalls in Tennessee. The hike to Virgin Falls and back is about nine miles total, with a few steep climbs and some rocky sections. Along the way, you’ll pass Big Laurel Falls, which drops over the mouth of a large cavern like a glistening curtain before flowing underground. Virgin Falls itself is an impressive sight, as the main viewpoint is at the middle of the falls, rather than the base or the top. The waterfall roars loudly as an enormous amount of water rushes into the pool at the bottom. This trail is great for a long day hike or a short backpacking trip and has several scenic campsites that can be reserved online. Bonus: Make the time to detour from the main trail to take in the beauty of Martha’s Pretty Point overlooking Scott’s Gulf and the Caney Fork River. Also, if there’s time upon departure, travel a bit past the Virgin Falls trailhead to experience a sunset from Welch’s Point, offering an alternative perspective to that of Martha’s Pretty Point. This fan-shaped 30-foot waterfall is nestled inside Stinging Fork Falls State Natural Area about an hour and a half southeast of Cookeville. Though the hike to the falls is less than two miles, parts of this trail are steep and rocky, presenting a fun challenge for intermediate hikers. The area around the falls is especially green and lush, giving the feeling of a secluded oasis in a dense second-growth forest. As the name suggests, the trail does come to a fork, where the right branch leads to the base of the falls and a refreshing swimming hole. Bonus: Make a pitstop at Ozone Falls, another picturesque waterfall, just off I-40 in Crab Orchard (Exit 329). A two-mile lollipop loop trail near Jamestown offers visitors gorgeous views of sheer cliff faces, a vibrant oak forest and, of course, the 70-foot Northrup Falls. Located in the Colditz State Natural Area, the trail to the falls is somewhat technical, with several places becoming narrow, rocky, and wet on the descent to the base. At the waterfall, you can enjoy the lovely clear pool, or even walk behind and underneath the falls. Northrup Falls is a low-volume waterfall that reduces almost to a trickle in dry weather, so it’s best to visit after rain.